When it comes to baking and baking pans, KAISER is the name that immediately comes to mind. After all, the KAISER brand is synonymous with inspiration, creativity and enjoyment. 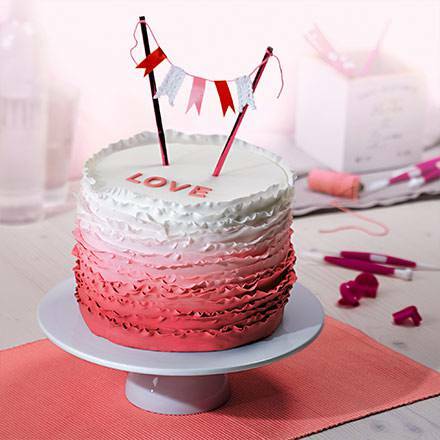 Whether you are preparing, baking, decorating or serving, KAISER products are your reliable partners for home baking. 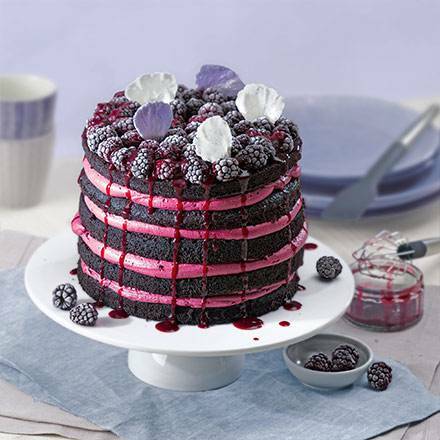 Baking pans and dishes, accessories for sweet and savoury delicacies as well as classic and modern flans with creative fondant decorations, cookie cutters, pop pans for muffins and cakes and much else besides accompany baking enthusiasts at every stage of the baking process. 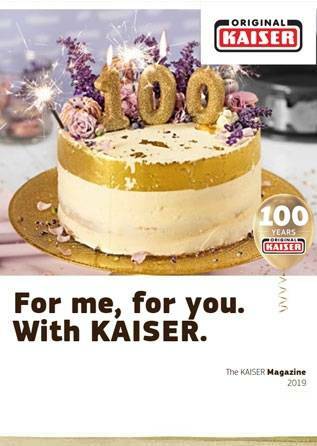 No matter whether you prefer sweet or savoury, the KAISER brand supports the love of home baking and is the reliable partner for all those people around the globe who like to show off their baking prowess. 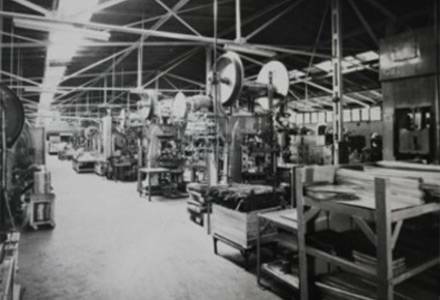 A wealth of manufacturing expertise based on more than over 90 years’ experience as well as high-quality products form the basis for a unique product portfolio. Our extensive range of baking pans, trays and accessories help you navigate through everything from simple muffin recipes to complicated cake creations. Baking pans Pans with attitude: round or square, with or without bases, smooth or fluted. Baking aids The anticipation is palpable. But first there's the preparation. Relax. 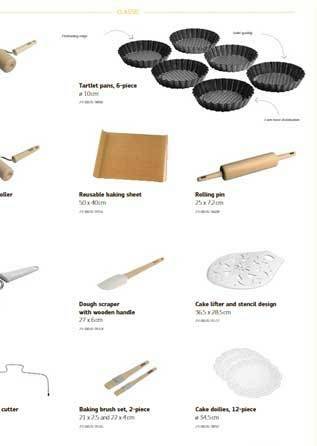 We have everything you need to prepare your baking marvels, both large and small. 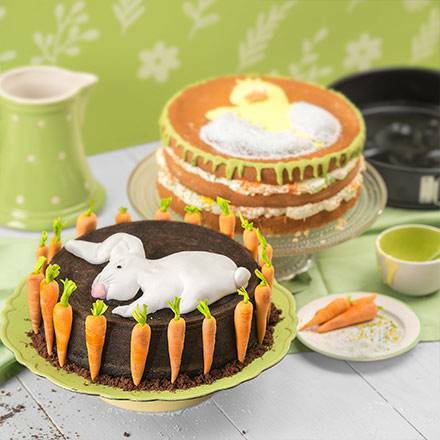 Creative baking When you are shaping, decorating and cutting with fondant, KAISER products enable you to do everything you previously thought was impossible. 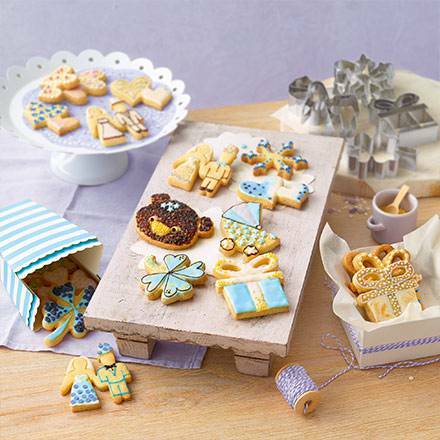 Cookie cutters Make every occasion feel festive with some lovely little baking or biscuit creations. Savoury baking From pies to quiches, perfect results every time, even at high temperatures. Thanks to its well-designed shape and size, the new SafeClicK clasp on the La Forme Plus springform pans makes handling your creations easy and safe. The springform can be opened with a simple flick of the clasp. An integrated serving plate now enables you to decorate your cake as you prefer and then bring it directly to the table. A ten-year warranty and the perfect non-stick properties of a KAIRAMIC® ceramic coating ensures all pans from the range continue to meet the highest demands. By further developing its La Forme Plus springform pans, the KAISER brand has again set new standards in the world of baking. The original SafeClicK closing mechanism, designed by KAISER. 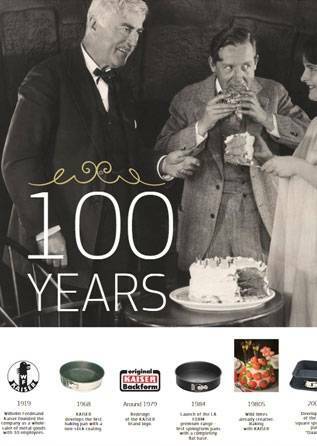 When Wilhelm Ferdinand Kaiser founded a wholesale enterprise for metal goods in the Erzgebirge Mountains, in 1919, it marked the beginning of a unique ascent from a small business to a market leader for baking pans and accessories. 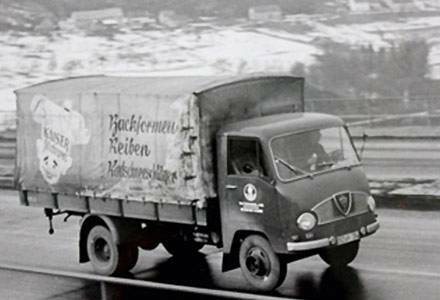 Starting from scratch again after World War II, the company expanded quickly, and in 1978 it moved to its present location at Diez an der Lahn. An excellent understanding of the needs of its customers has been – and indeed remains – a significant growth driver. After all, products that make life easier and reflect the spirit of the time help make brands successful. This applies particularly to innovations that continually set new standards in the world of baking through their creativity and great passion. 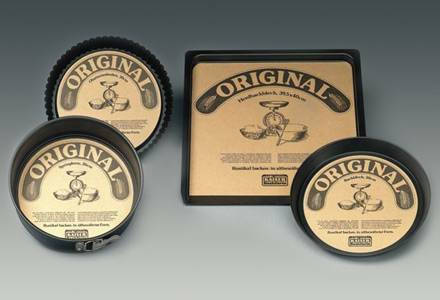 For example, back in 1968, KAISER became the first company worldwide to introduce non-stick baking pans to the market. This caused a minor revolution and heralded the dawn of what is still considered the “original” baking pan. Just a few years later, the La Forme range offered home bakers a springform pan with a completely smooth base. Further developments, such as baking pans with leak-proof bases and the first square springform pan, were launched as part of the La Forme Plus range. 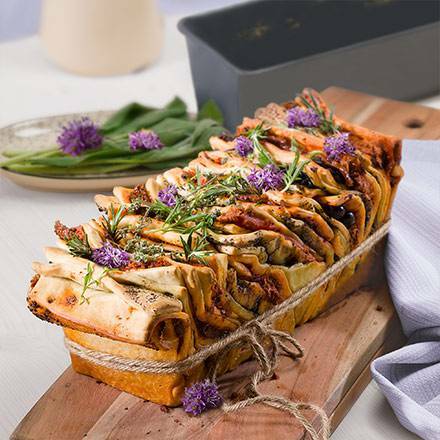 This series was characterised by one particular innovation: KAISER baking pans were made with KAIRAMIC®; a proprietary ceramic non-stick coating developed by KAISER and made in Germany. This was unique on the market. In addition, the baking pans were fitted with a completely newly-developed clasp that allowed the pan to be unlocked easily and comfortably with a simple flick of the hand. Further innovations followed, time and again, resulting in great home-baking products. In this way, KAISER proves it is a company that demonstrates skills in all areas through a diverse range of products that is constantly and elegantly adapted to changing demands. Crumble the butter cookies and melt the butter. Mix the butter and crumbled cookies together and stir in the sugar. Transfer to a 20cm La Forme Plus springform pan and press down with a spoon. Put the base into the fridge. Whip the cream and put it in the fridge. Whisk the quark, mascarpone, icing sugar, vanilla sugar and lemon juice until they form a creamy consistency. Place a flan ring around the flan base. Divide the quark mixture into thirds and combine 2 of the 3 portions with the desired amount of blueberry mixture. Add a little more to one portion and a little less to another (depending on your preferences and the desired colour). a. Put the first portion (the darkest one) aside and put the remaining two in the fridge. Dissolve 1 portion of gelatine and quickly stir it into the darkest portion. Add 1/3 of the cold whipped cream and stir again. Now measure out about 0.5l and pour it over the base. b. Repeat the process with the next portion of quark mixture. Pour gelatine over this portion and wait another 2 hours until the mixture has set. Repeat the process a third time with the last portion of quark mixture. Store in the fridge overnight or for at least 4 hours. 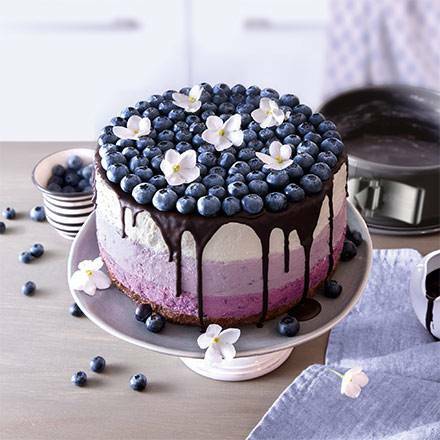 Remove the finished cream cake from the tin and decorate with chocolate, blueberries and edible flowers.